Nicki Minaj has praised Taylor Swift after overtaking her in the ranking of female solo artists with the most charted Billboard Hot 100 entries in the US. Minaj edged past Swift in the rankings on Tuesday (February 7) after her feature on Major Lazer‘s latest single ‘Run Up’ charted at number 66 in the US singles chart (for the chart dated February 18). The achievement notches Minaj’s record of Billboard Hot 100 appearances up to 71 – one more than Swift. On becoming the second-highest female in the rankings – Aretha Franklin is still out in front with 73 – Minaj thanked her fans before recognising Swift, who now sits in third place with 70. Minaj and Swift famously fell out after a disagreement on Twitter in July 2015. 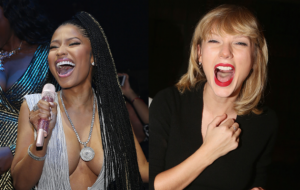 The post Nicki Minaj sends message to Taylor Swift after surpassing chart milestone appeared first on NME.